Hot on the heels of all the recent attention to the CHP lane splitting guidelines, California State Senator Jim Beall introduced Senate Bill 350, a vaguely worded bill which – despite its lack of specifics in most areas – seems to place conditions on lane splitting in very specific cases. 1. The passing occurs during traffic congestion. 2. The passing occurs at a safe speed. An optimistic reading of this is something “As long as you behave and split safely, we’ll leave you alone.” We only really split when traffic is congested – otherwise we’re just changing lanes, and we should be doing so safely. It’s wide open to interpretation by law enforcement – exactly as it is now. This part of the bill doesn’t sound so bad – assuming the LEOs continue to enforce about as they do now. …when a highway has been divided into three or more clearly marked lanes for traffic traveling in the same direction. So it sounds like Beall is only interested in addressing splitting on roads with three lanes or more – is he trying to address higher-speed splitting on the freeway, the “That guy came out of nowhere at 90 MPH” driver complaints like in this video? Why not just leave it at “split when it’s safe, at a safe speed” like it is now? Some folks I’ve spoken to think a well-written law would be a good thing and I tend to agree with this. I would likely back a law that provided some legal ground stand on, as long as it was thoughtfully written around general concepts of safety and efficient transport. However, this bill is at the same time too specific and too vague, rendering it pointless and unnecessary. Hurt Report of 1981 reached the conclusion that lane splitting improves motorcycle safety by reducing rear end crashes. 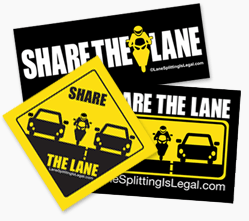 2 Pings/Trackbacks for "CA Senator Jim Beall Introduces Bill To Legislate Specifics Of Already-Legal Lane Splitting"